Inside the newsroom, an intern asked what type of sandwich I would like from Togos. The assignment desk reassigned him from answering phones to making sure the rest of the staff had enough fuel to power through our wall-to-wall coverage of the Roseville Galleria Fire. “No thank you,” I said. I didn’t mean to wave him away but I was in the middle of logging an interview with the Roseville Mayor, uploading viewer photos on the fire and keeping tabs on where our reporters and cameras were stationed for the biggest news story of the week. So far. He had his assignment and I had mine. Both of us didn’t want to disappoint the newsroom. As I worked into my 9th hour at the station, I wasn’t ready to give up my focus on all the cameras trained on that dark plume of smoke from a fire that was burning all day. On big stories, whether it’s Election Night or a devastating structure fire, all staff members understood that we need all hands on deck. My plans for taking care of a fun slideshow and other web extras on the Phillies vs. Giants game flew out the window. I kept my ears open for any updates from the assignment desk and the scanners. I kept refreshing my Outlook box for new messages and photos. I kept typing up interviews from emergency responders and law enforcement members who did live interviews with our reporters in the field. I let myself get swept up in the adrenaline rush of breaking news. Inside the newsroom, producers, assignment desk editors and other journalists kept digging for information. “Whoa!” was the collective gut response to live pictures of massive amounts of smoke pouring out of the mall. Those pictures mesmerized us for a few moments. Next, any plans for a “normal” news show flew out the window. My colleague on the web desk stared at my garlic sesame nuts. We shared the nuts as we continued to update online stories. Management knew the dayside crew will end up skipping lunch breaks. So, they ordered pizza pies for the newsroom. I was munching on a combo slice as I punched up live camera sources for the thousands of people watching our news coverage online. Thankfully, we didn’t have any causalities. 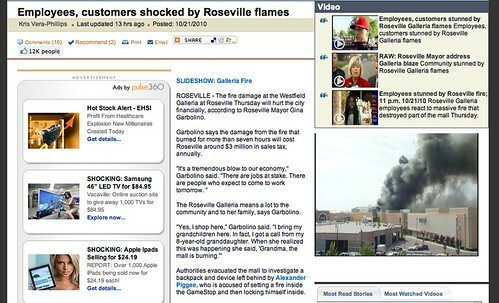 However, it was clear that the fire damage will hurt the mall businesses and community of Roseville.